"Working hard to develop a new Amish community outside of Unity, Maine, Rhoda Byler is fully committed to rehabilitating an orchard with business partner Samuel King. But an impulsive decision has created an unexpected strain in her relationship with her beau, Samuel's brother, Jacob, threatening plans for the orchard. Amidst mounting tension in matters of the heart and business, Rhoda finds that this fledging settlement feels like the home she has always longed for, and she begins to embrace the God-given, heightened intuition that has always felt like a burden to her. She longs for Jacob to fully be free of his past, so they can work towards the future together. But as Rhoda uses her gift to unpack an old secret with her Englisch neighbors, it is not her beau but an unlikely ally that cheers her on. With the orchard on shaky ground and Jacob's plans in question, Rhoda is determined to see things through to harvest. But can she trust her insight to direct her path in matters of the heart?" When I first agreed to review this book, I somehow missed that it was the third in a series. That being said, I was very thankful for the section in the book that gave a synopsis of the story so far. Now, onto the real review... The author of this book must be commended for how developed her characters are. Granted, she's had three books to do so, but it's a skill that not every author has. There were times, when I was reading, that I felt as if I were a part of the book. I could smell the apple blossoms and see the farm in my head. I could envision Samuel and Rhoda and each of the other characters. I laughed with them, I mourned with them...and at the end of the book...I wanted more of them. That being said, I would recommend reading the first two books in this series first. There were times when I desperately wished that I had. I received a copy of this book through the Blogging for Books program. All thoughts, opinions and comments are mine. Monty, a topnotch operative, worked on the Bird-in-Hand assignment and helped bring down the New Patriots. A recurring dream prompts him to rescue his boss from possible murder. The agency might not be sending him on assignment, but he knows God is directing his path - one that could wreck his career, family, and cost him his life. 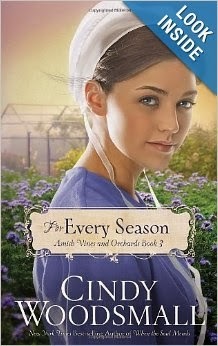 I noticed that you like Amish fiction. This book would be labeled under Amish Futuristic Suspense. If you would like to be a part of the blog tour, I would be happy to forward a PDF copy of the book to you and then set up a schedule of when everyone would post their reviews. I am hoping to get the blog tour together in December and there will also be a $25 Amazon GC and book giveaway involved also. If you have any questions, please don't hesitate to contact me. Thanks for your consideration!